Dribblin' On: Thought Bubble 2014. I left Stoke on Trent on the 8.20 train and arrived in Leeds just shy of 10.15…no bad if’n I do say so. Quick 15 minute walk from the station to the Royal Armouries (where the event has been held for a few years now), a couple of minutes queue for my “Weekend Pass” wrist band and I’m all set to go. They had erected a marque this year…The Thought Bubble Tee Pee, slap bang in the middle of the New Docks Hall and the Royal Armouries Hall. And I gotta say that worked a treat. None of this wandering off track looking for the third hall. The bulk of the overseas professional guests were housed in the Tee Pee so there were no queues in the other halls blocking tables. I quickly located “Accent UK” table in the New Dock Hall…Dave West, Colin Mathieson and Colin’s son Scott, standing behind their table, set up and ready for whatever the weekend would bring. Next table to them was Andy Bloor and Mo Ali promoting and selling their brand new Book. Now Andy does all the design work on Accent UK’s books and Mo had written a fair few tales for their anthologies so it was like a big ol’ Accent UK get together. I handed over a dozen new watercolour sketches that I’d finished especially for Thought Bubble, took off my jacket, rolled up my sleeves and stood ready to sell as many books I could. 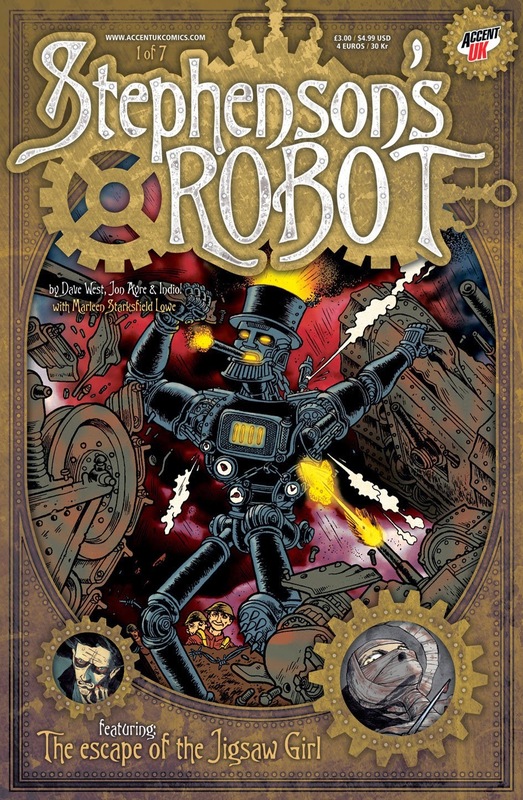 “Stephenson’s Robot”: -A wonderful over-the- top steampunk romp. Fulla strange folk, Robots and Germans…What a combination. 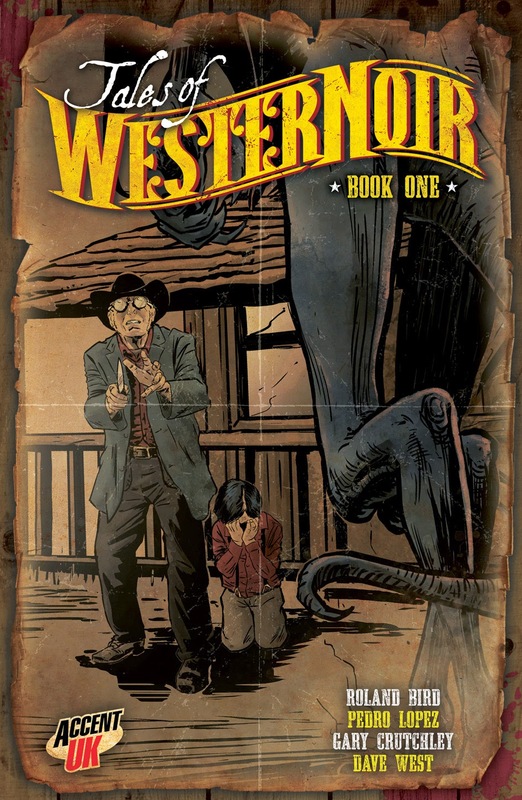 “Tales of WESTERNoir”: - Short stories that tell the back stories of folk Dave and I have created in the pages of the critically acclaimed on-going series: -WESTERNoir. The fantastic first issue contains two tales featuring the artistic talents of Rowland Bird (who illustrates a tale of mine: -Loose ends) and Pedro Lopez (illustrating Dave’s tale: -The Kiss of death). All topped off with a little background information on how WESTERNoir came to be. I can see the discerning readers amongst you already tempted by both of these books. So, as is the norm at these events…the first hour sales are slow. Folk tend to wander about, see what’s what, before they part with any cash. Hell, I’m like that meself…nothing worse than seeing something late in the day and no money left to spend. Colin and Scott ambled off, to see what’s about and possibly grab a bite to eat, leaving Dave and I to man the table. And we saw loads…Many eager to pick up WESTERNoir book 4…desperate to see what’s happening to Josiah Black. No wonder I was feeling hungry. So food it was then, in a great little Bistro just around the corner to the event. Then it was out and about to have a good looksee as to who was in attendance. The only “guest” I planned to see was Brian Hurtt: artist on The Sixth Gun, the Damned and Queen and Country. and wanted Brian to sign it…Not only did he sign it but he drew wonderful sketches of the main characters for both me and Dave. Because it took longer than anticipated, we decided to head back to the table, but not before I said a brief hello to my old mate Mark Buckingham. I’ve known “Bucky” for many, many years and the only time I get to see him is at these events. It was grand to see him busily doing sketches for a heap a folk. He’s an extremely popular artist: with “Fables”, the “Fairest” and writer/artist on “Dead Boy Detective”. Back at the Accent UK table Colin and Scott had been kept busy which reflected in sales. By the end of the day we’d sold more books in the one day than both days at last year’s event. In fact, it wasn’t just us with record sales, everyone attending was doing extremely well. It seemed folk were in the mood fer comics. There were plans afoot to meet up for an evening meal with a few friends. There is an official Thought Bubble function in the evening but we all fancied a quieter time. I had to book into my hotel first…I hadn’t been able to book a room in the Hotel that’s right on the doorstep, as it were, I missed their last room by ten minutes but it didn’t matter as I managed to get a room not five minutes away. Just across the road from the “Palace” pub in fact…the place where we planned to eat. So a very good night was had, good food, great company and talk all things geekery…what more could a person ask for. After a modest breakfast and a leisurely stroll from the hotel, I met up with Dave, Colin and Scott outside chatting to a friend of theirs (about next year’s conventions as it happens). But it wasn’t too long before we were back behind the table, chatting to potential customers. It’s grand to get people’s reaction to the books you help create. When someone comes to you and shouts “NO!!! you can’t leave it like that!! !” after reading Book 4 of WESTERNoir then you know you’ve made a connection and they “get” what Dave and I are doing. Makes creating these books very worthwhile indeed. Sunday being quieter meant that I could wander about the halls more and talk to friends. Friends that I only get to see face to face at events like this one. And then…All too quickly it’s over. It’s time to pack up and head home. Matt is well-known for Scarlet Traces, War of the Worlds, Stickleback and loads more. More recently his book Ordinary (written by Rob Williams) has been collected. And a cracker of a tale it is too. It was grand to sit with Matt enjoying a pizza and a catch-up. It really has been a while. But all things come to an end and I say my farewells to Matt...until next time that is. We were all feeling pretty pleased with ourselves traveling home. A final tally of sales had been done and not surprisingly this was the best Thought Bubble ever, and the WESTERNoir books accounted for just over 40% of the total sales so I'm well chuffed. It had been a cracking convention and according to Dave and Colin an amazing end to a great year...Year on year sales had doubled in fact! So no arguments from me then. There are plans afoot to release more books including three WESTERNoir titles, so I got high hopes it'll be even bigger and better next year for Accent UK. Dave's already got his targets set for next year and is looking forward to it. I'm desperate to finish WESTERNoir Book 5 (or the beginning of Season 2 as I like to call it) so it's ready for the first convention that Accent UK plan to attend in 2015. Yep... That sums it all up very nicely Gary. It was a great end to a very busy and productive year... Enjoying every thing we're working on and can't wait to get more of the story out there. Hey I told you I'd keep Scott & I's lunch short! TB14 was indeed a special way to end our comic convention season. If we can carry our success into next year I'll be very pleased, thanks again gary for your contributions!